This month’s laurel goes to a NZ-based artist who has been making fascinating speculative works carved from wood. As she explains below, the abacus series emerged from a mystical adventure. We have an abacus at home that is an heirloom from my husband’s (Russian) family. They brought it with them from Harbin, China, after a generation and a half living there in exile. They moved to Australia in the mid 50’s I believe. I’ve always enjoyed looking at functional objects and re-imaging their purpose, much like the lawnmower and scissor lift in previous works. It leads me to ponder how we label, and quite possibly mislabel items, particularly in museum collections. I’ve always had a fascination with the ornate work of finely crafted objects used in ritual or religious ceremony in particular. The aura or soul of inanimate objects was something that piqued my interest in reading about Javanese mysticism during my Asialink residencies in Indonesia. 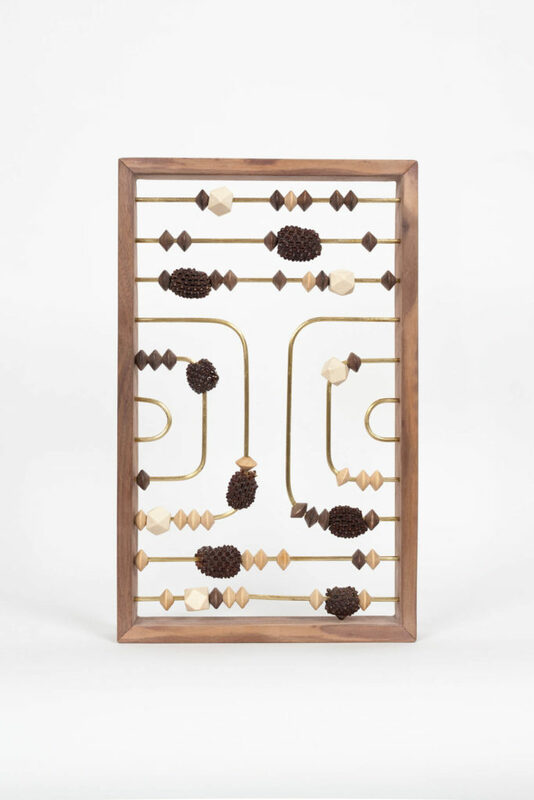 My first iteration of the abacus was in the exhibition The Ceremonial Processions of Dreamers, at Lindberg Galleries in 2014. At this time, I was thinking about the nature of reality, the beads like atoms and molecular structures. The bent rods were for me at the time thinking about abstracted landscape painting (in particular Colin McCahon’s works Waterfall, A Hillside, headland etc). I was also keen to connect with the Australian landscape through the collection of sheoak nuts and banksia. I thought about making contemporary work that was deeply rooted in the Asia Pacific region. In the exhibition a wood carved figure on a table had its gaze resting on the abacus, which was hung on the wall (referencing painting). In my next body of work after moving to New Zealand, I created the Levitation Practice series, where I carved a series of figures attempting levitation through some kind of spiritual practice. Though they were sculptural illustrations or teaching devices from a future time on how to levitate. As part of the fiction, the sculptures had abacus on small plinths beside the figures. I thought of them as aids to ground their spiritual practice in a method and structure or a way of integrating their spiritual learning. In some ways an absurd attempt at calculating spiritual development, counting that which could not be counted. These abaci were found and reworked pieces. In 2018 I began returning to creating my own abacus as Higher Consciousness Integrating Calculators. They have now existed in exhibitions as pieces outside of narrative and without the gaze of one of my wood carved figures, which has been quite liberating. I have used sheoak and gumnuts as the counters. The gumnuts coated with resin have an interesting raku like quality. I’ve also used abacus beads from old broken abaci, enjoying the historic potential or energy of past users, and have also used new abacus-like beads. I exhibited these at Bundoora homestead in One on One, curated by Olivia Poloni and at the Townhall, Hawthorn in This Wild Song, curated by Ilona Nelson. In my upcoming exhibition at Sanderson, I plan to have two circular formations of these works, 5 in each group. I’m interested in the power they command as a group and the connection to the ancient calculators of Stone henge (as I think more about the monumental and public sculpture). I’ve also recently created a large one as an outdoor piece and am interested to see how they work in a public sculpture context. I’m working between several spaces. I go to a men’s shed type place to put the wood through a thicknesser. Then under the house I have a table saw to cut the wood (not an ideal space as I keep bumping my head), then I have a studio garage shed type space to do most of the work (I have to drill the holes in the beads slowly larger and make holes in the nuts that I use, then I resin coat the nuts which takes several days). I usually start putting them together at the kitchen table and when I’m ready to glue, take them back into the shed. I usually try to do the sanding outside. I design the shape of the rods within the abacus on a piece of paper first, then I translate those lines to holes which I drill with an old drill press. I bend the brass abacus rods around various circular instruments in my studio to get the right shape. I then sand the brass rods as I prefer the textured hand worked appearance than the shiny surface. Putting them together for glueing is quite a tricky process and requires trial and error and considerable patience. I’ve also been creating cast concrete plinth’s to hold the works lately, which is an entirely different process, sculpting clay, making a mould, pouring concrete. Wanda Gillespie’s work can be seen in Sanderson Contemporary and Vivien Gallery.